As I'm sure many would agree, tying for a trip is the most fun kind of fly tying. Often times, I look at a fly and think, "Yeah, this is the one." Out of a pile of the same fly pattern, one particular one will jump out at me and earn a prominent place in my fly box. Sometimes a fly stands out to me for other reasons. These variations on Marc LeBlanc's Out-to-Lunch and Jones Special looked like flies I should consider using closer to home than the Gaspé Peninsula river for which they were designed. The Out-to-Lunch is one to try for Connecticut's broodstock Atlantic salmon. Last season, I fished and guided a few days during high, dirty water conditions. Those are exactly the conditions for which this fly was designed. As you can see, this is a highly visible fly, if not obnoxious looking. I am going to put a couple in my early spring fly box and see what happens. The original Out-to-Lunch dressing calls for embossed silver tinsel for both the tag and the body. I substituted oval silver tinsel for the tag and silver flat braid for the body. LeBlanc uses oval green tinsel for a rib on his Out-to-Lunch. I have no idea where to find that, so I subbed medium sized green Ultra Wire. The original dressing calls for a wing of lime green or olive Krystal Flash. 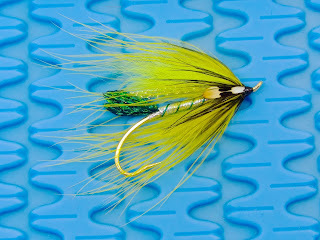 I used lime green Krystal Flash, but topped it with yellow arctic fox to beef up the profile of the fly. 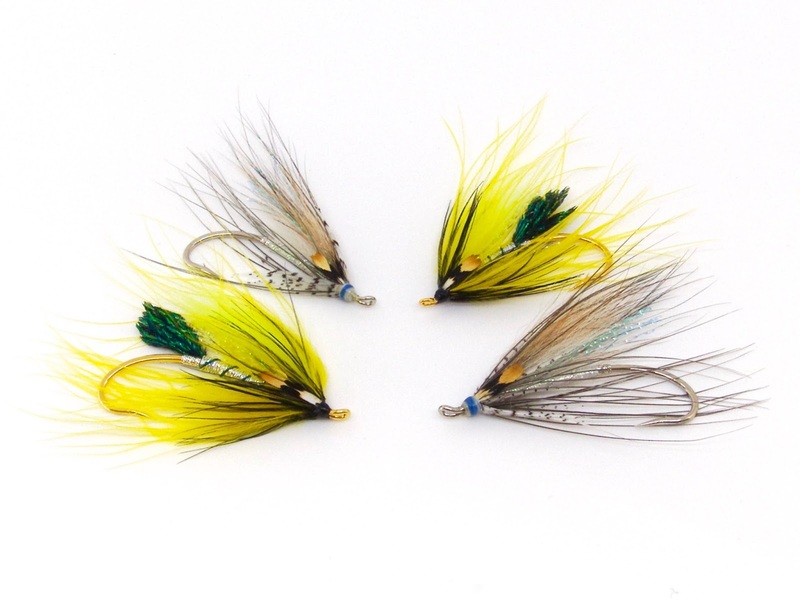 Finally, LeBlanc uses yellow and black dyed heron hackle collars. I didn't have any yellow, so I subbed yellow marabou. For the black heron, I used a dyed golden pheasant rump feather. Not counting the hook and the thread, I used more substitute materials than I did original materials. I think the overall effect is similar enough to work fine when the fly is needed. Of the two flies, I prefer the look of the Jones Special. LeBlanc created the Jones Special to represent the silver smelt, a favorite food of sea run brook trout. Eventually, it became an effective Atlantic salmon fly. Before I tied a Jones Special, I thought it would be confined only to my salmon fly box. After tying my first, I looked it over as it sat in the vise jaws. Then it hit me. 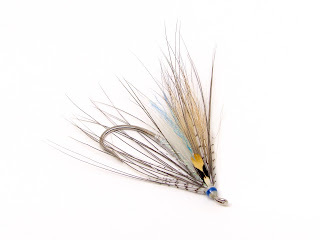 This will be a killer fly for spring sea run brown trout and striped bass. I can't wait to try it in the coming months. I stuck closer to the original dressing of the Jones Special than I did with the Out-to-Lunch. The only substitution I made was in the wing. 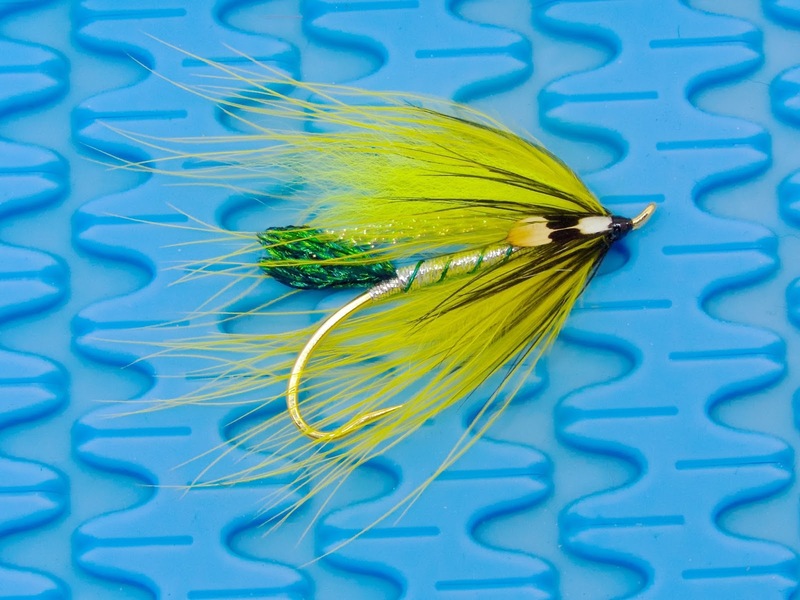 I subbed fox fur for bucktail, a common substitution in modern salmon flies. Other than that, the dressing stays pretty true to the original. This winter has been short and mild. I can't really say that cabin fever has set in. I'm having a great time tying flies. It will be nice to get out on the water soon, though. When I do, I will have these two flies with me. The Jones Special is so clean and crisp.